Have you noticed a brown patch in your lawn that gets bigger every day? Armyworms are out in force right now. These invaders are not picky when it comes to what they consume. From oats, rye, corn, and grain, these worms will feed on a variety of crops. But they’ll also infest your lawn. Damage from armyworm can seem to appear overnight. Although the damage might appear overnight, larvae have likely been feeding for a week or more before they or their damage appears. You can usually identify these worms by their distinctive upside down “Y” design on the head capsule. 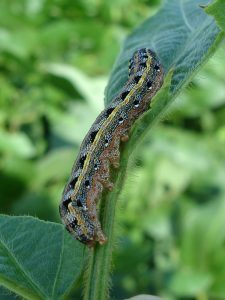 Fall armyworms can be green, brown or black, and as long as 1.5 inches. It’s best to detect these pests in your fields early mornings or late evenings. During these times you can access how bad the infestation is. Once you determine that you need a control plan, it’s time to find the best product to eliminate these critters from your fields. The most common insecticide against armyworms is called Sevin SL. This product works really well on hay fields, lawns, pastures, and food plots. Stop by Argyle Feed Store this fall and defend against armyworms with Sevin SL. This entry was posted on Tuesday, September 11th, 2018 at 11:12 pm	and is filed under News & Updates. You can follow any responses to this entry through the RSS 2.0 feed. Both comments and pings are currently closed.